If you’re fortunate enough to have a woodburning stove to keep you and your home warm you may need to protect small children and animals from touching it. Our sturdy, handmade fireguards help to prevent anyone falling onto the hot stove or open fire. We don’t make folding sides on our fireguards as these aren’t effective as guards at all. 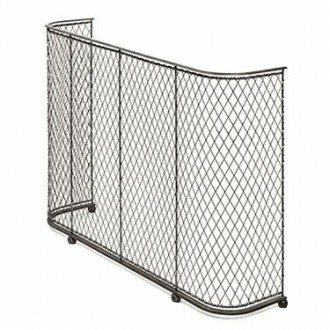 Historically, woven wire fireguards were called Nursery Fireguards and every home, school or place of work would have a fireguard to prevent accidents. Today, they have the same protective role to play as well as being beautiful objects in their own right. We’re sure you’ll want to pass yours down to your children or grandchildren. Call us on 01225 851577 for any help in measuring your fireplace and for stock availability.